2 Full Acres within 2 Miles of Interstate 85! Great Lot w/ Huge, Private Back Yard & Circular Drive! 2 Car Garage, Workshop, Storage Shed & Double Carport! Welcome to 2245 Turner Road in Mebane, NC. Conveniently located just two short miles from I-40/85, this property is a quick commute to Greensboro, Burlington & the Triangle. The home features a circular drive as you pull up which opens onto a very usable front and rear yard, although much of the property is wooded. A rocking chair front porch stretches the width of the front of the home, and there is a nice deck on the rear as well. 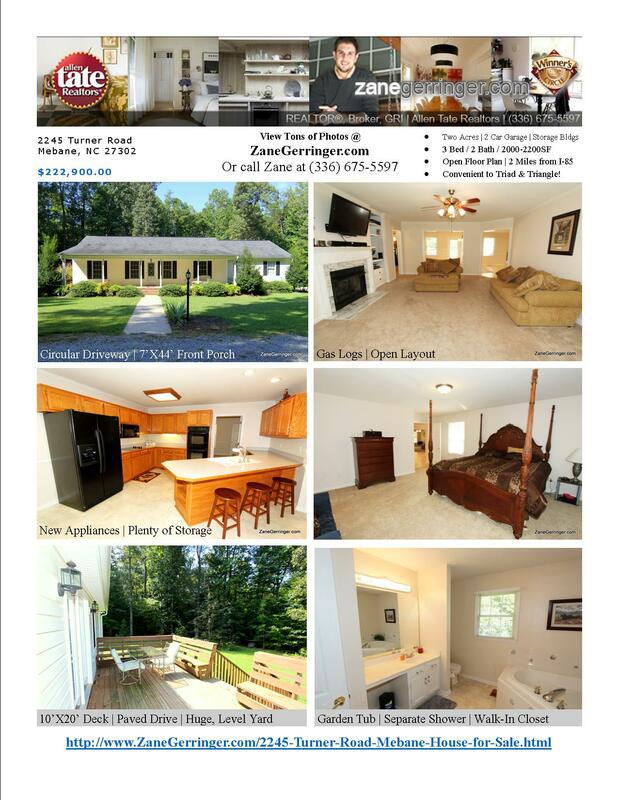 Come see in person the tremendous value offered at 2245 Turner Road today - call Zane or your Realtor today for a showing! 2245 Turner Road is a very desirable piece of real estate. With private, wooded acreage as well a beautiful home and convenience to nearby towns - this property has a lot to offer. Come see for yourself today! Want More Info On 2245 Turner Road?